Cherries are a nutritious sweet treat and a colorful addition to many foods, including salads and other savory side dishes. A relative to peaches, plums, and apricots, cherries can be used in recipes and used interchangeably with some other stone fruits in recipes. One cup of raw cherries contains about 90 calories, 22 grams carbohydrate, 3 grams fiber. Most of the calories in cherries come from sugar. Each cup of cherries contains about 17 grams of sugar. If you are monitoring your carbohydrate intake, try to stick to about 12 to 15 cherries at one sitting. The glycemic index of cherries is estimated to be about 22 with a glycemic load estimated to range from 3-7 for a one-cup serving. 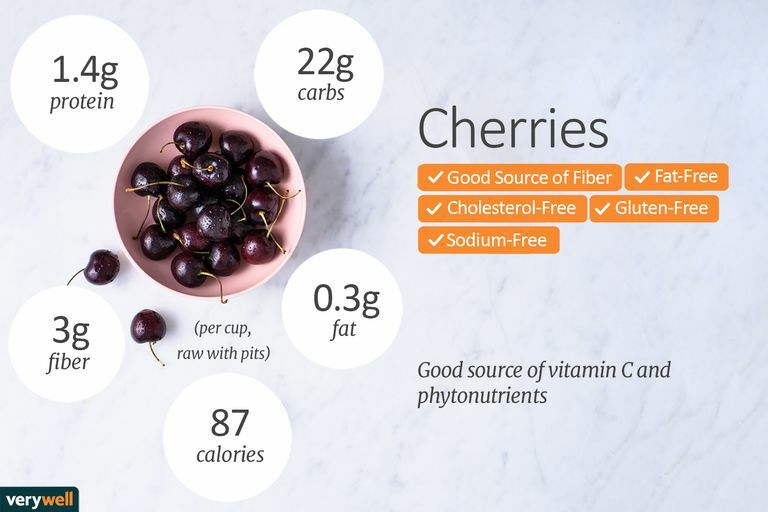 Cherries are almost fat-free, providing less than one gram per serving. There is just over one gram of protein in a cup of cherries. Cherries are a good source of vitamin C, providing about 15 percent of your daily needs per cup. Although cherries are moderately high in sugar they have a large amount of phytonutrients. Cherries' beautiful reddish maroon pigment comes from health protective anthocyanins. Research suggests that anthocyanins may fend off certain chronic disease, including cardiovascular disease and certain cancers. Cherries are also a good source of fiber. Studies have shown that people who eat fiber-rich diets are at decreased risk of heart disease, maintain healthier weights, and achieve better blood sugar control. There is also limited research on the effect of cherries in various forms, like cherry juice and cherry bark, on muscle soreness, and other various health conditions like arthritis, and overall health. However, there is not enough evidence to confirm these benefits. What are some of the different types of cherries? There are different varieties of cherries, some of which are sweeter than others, and some that taste sour. Cherries can vary from bright red, maroon, to yellow-red in color. The most common form of cherries are Bing cherries. Other varieties include Rainer and Washington Red Cherries. Are cherry pits edible or toxic? It has been thought that eating the pits of cherries is toxic because they contain a cyanide-producing chemical. This seems to be controversial. While some people believe the seeds are toxic, others claim they are therapeutic. Apple seeds, cherry pits, and other seeds from the Prunus family contain a natural substance called amygdalin, which can be degraded into several end products, one of which is hydrogen cyanide. Hydrogen cyanide is toxic. The amount of cyanide that appears to be toxic for the body is based on consumption. It's probably okay to ingest an accidental seed, but eating all the seeds is probably not prudent. When in doubt, it makes sense to avoid eating the seeds. What is the best way to choose and store cherries? Choose fresh cherries that are free of damage and appear plump in size. They should not be shriveled. Look for those that are shiny and firm with green stems attached. Avoid washing cherries until it's time to eat them. Washing them too soon will cause them to deteriorate faster. Store cherries in the refrigerator in a plastic bag or covered plastic container. Cherries will last in the refrigerator for about five to ten days and in the freezer for six to eight months. Cherries can also be bought frozen or bought fresh to freeze on your own. If you plan on freezing your own cherries, it's probably best to remove the pits first. When purchasing dried or canned cherries, read labels before consuming and stick to one serving. Consider using dried cherries in your recipes because they hold up well and you only need a small portion to receive the benefits cherries hold. Cherries can be used in many types of recipes. Add cherries to low-fat Greek yogurt, cottage cheese, or ricotta cheese for a high protein breakfast or snack. Toss a few cherries into salads or include cherries in savory dishes to add sweetness, color, and texture. Cherries can be used to make some not so healthy food choices too as they are common ingredients in baked goods, such as pies and pastries. Consume these types of foods in moderation, as a special treat. American Academy of Nutrition and Dietetics. Position of the American Dietetic Association: Health Implications of Dietary Fiber. J Am Diet Assoc. 2008;108: 1716-1731.